Blue light is practically everywhere, the light that travels from the Sun through the atmosphere has shorter, high energy blue light wavelengths that crash with air molecules causing the sky to be blue. Your body uses these natural forms of blue light to regulate its natural sleep and wake patterns – also known as the circadian rhythm. Your body also uses it to regulate mood, boosts alertness and increase reaction times. Artificial sources of blue light come from devices such as phones, laptops and LED lights. Since the waves are shorter they flicker more which creates a glare that reduces sharpness and clarity in your vision. With an average UK citizen spending an average of about 8 hours and 45 minutes a day using digital devices, have you ever wondered what possible effect this may have on your vision? 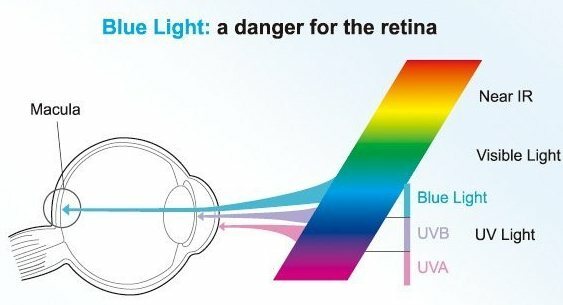 Our eyes don’t provide sufficient protection from blue light from the sun or digital devices, therefore prolonged exposure to blue light may cause retinal damage and can contribute to the development of age-related macular degeneration, which can potentially lead to permanent loss of vision. In the short term there are affects which you should be aware of. Digital eyestrain or blue light eyestrain syndrome is the result of prolonged computer/tablet/phone use. The eye is made to work harder when looking at digital screens which leads to patients experiencing discomfort to the eyes and some problems with vision. 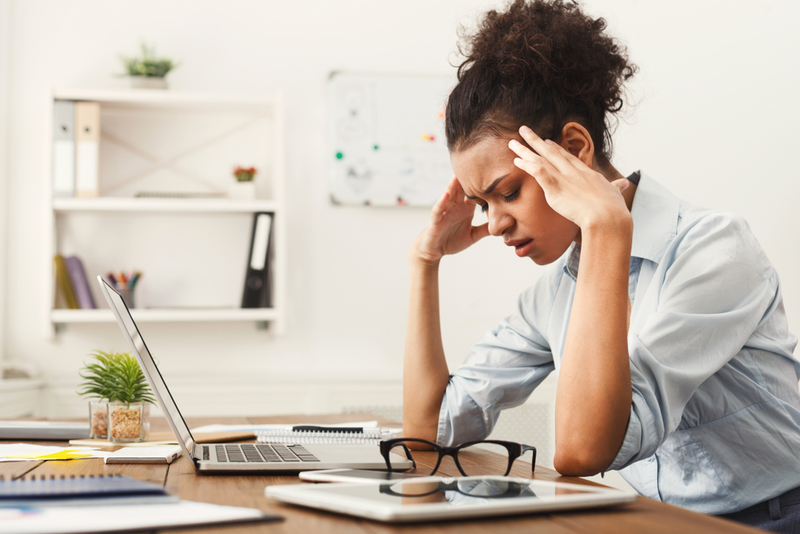 The effects of Digital Eyestrain include blurry vision, lack of focus, dry eye, headaches and potential neck and back pains. Computer eyestrain can be reduced or avoided by using various methods to reduce the time of exposure to blue light, as well as the use of computer glasses with special lenses designed to reduce to block blue light and reduce the effects it has on an individual. Some more serious effects have to be corrected using a program of vision therapy. Use night time mode on your devices – these reduce blue light and add a yellowish filter on the screen to help you sleep at night. Consider altering your seating position when using digital screens – have a comfortable and ergonomic chair with good arm support, also sit back further away from your screen. The distance will vary depending on the size of the screen that you’re using. If you find yourself to be suffering from the symptoms of computer eyestrain or just want to ensure that the hours spent in the office won’t damage your eye’s health, contact us on 020 7628 0330 for products that can help your vision or book an appointment to get a comprehensive eye test from one of our highly trained opticians.